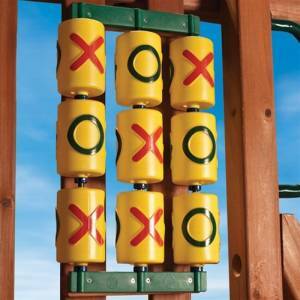 This Tic-Tac-Toe Spinner Panel is the perfect addition to your wooden swing structure to provide years of fun. All mounting hardware is included for easy installation on most residential wooden swing sets. 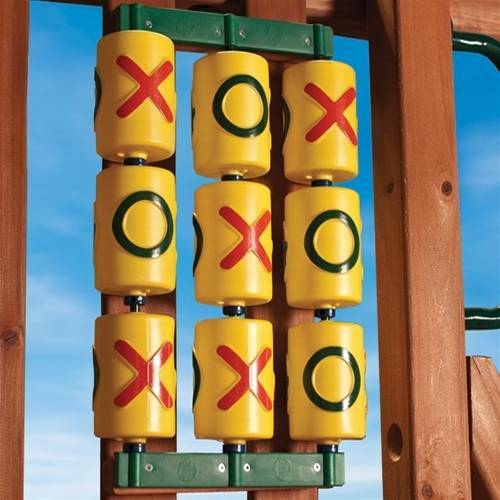 The Tic-Tac-Toe Spinner Panel includes 9 Multi-colors spinner cylinders, 3 Powder coated alloy spindles, 9 Spacer bushings, 2 Mounting flanges, and 8 Wood screws. Dimensions-19" tall x 12" wide X 3.5" deep. Note: Does not include wood parts. Installation requires (2) wood boards that are 23-3/4" in length. For safety, do not leave any spaces between spinner panel and any fort structure opening that are larger than 3.5in wide. Spinner Dimensions: 4.5in tall x 3.5inches diameter.